"Floydian Slip" is a one-hour, weekly radio journey through the history of the rock band Pink Floyd. Host Craig Bailey works classic Floyd songs, deep album cuts and Floyd’s unique brand of ambient segues into a seamless blend of music and sound best described as a listening experience. 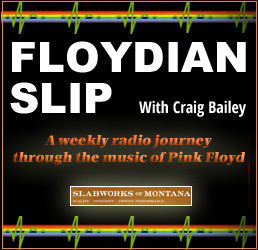 Accented with succinct and thoughtful commentary, “Floydian Slip” is programming that becomes a weekly destination for classic rock fans.